The Springtime quilt block is a nine patch block using four shapes or patches-- the square, rectangle, half square triangle, and (my favourite) the flying geese patch. So, all in all, this quilt block is a wonderful choice for honing your skills. With a name like Springtime I had to go with fresh and uplifting colours -- just what is needed at this time of year (I am writing this in the final days of winter). The sample quilts illustrated give you ideas for laying out your quilt blocks. 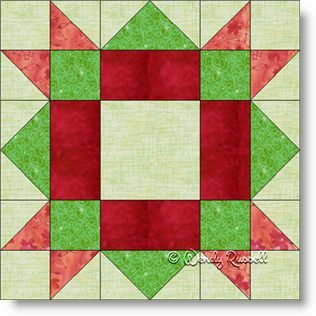 One quilt features a straight set of the blocks, with sashing, while the other sample uses an on point setting with additional squares to showcase your quilting skills.